When we casually look for the roots of 20th century Modernism, we look primarily to Europe. Too often we are, as Americans, in the habit of looking to a continent that has claimed itself ”the West.” Perhaps the claim would be benign if it simply described a location, but it has become more than that. For many born in the last century, it stood (as did the location “north”) for all things associated with intelligence, justice, and culture. I’ve observed that North-easterners, like me, ironically cling to our inclusion of this western model. We maintain New York as the point of transfer, noting the many Europeans that came to the United States in search of refuge. Names like Albers, Hoffman, and DeKooning ring out as some of the champions who fit this profile, with the work of Brancusi, a Romanian-turned-Parisian, brought to this country by the eternally influential French immigrant Marcel Duchamp. In truth, scholars have worked tirelessly to change this story, bringing proportion back to our worldview1. Many curators2 bring an assessment to a larger audience we know much more about, the omissions3 made intentionally, out of ignorance, or even fear. These exhibitions echo our concerns in the world at large, no doubt illuminating and perhaps fostering rips in the cultural and political fabric of the nation. Facts and history have a delicate place in our world today. I’d like to propose we make a science-minded addition to our typical thinking about art and influence. For example, a jawbone is found in Israel, and all of a sudden history of modern humans walking out of Africa may be older by 50,000 years4. That literal unearthing is a striking example of what still be missing from our story. Similarly, genetic and neurological breakthroughs, in areas of social behavior5 and epigenetics6 continue to roil the nature/nurture argument. Imagine making and seeing things in a way that has been genetically influenced by generations you’ve never met. When I look at things I read the language of the making first and imagery7 second. Second, I measure the history that I know against the observable facts. I realize I am looking at all of, and only, the decisions of an object’s maker(s). I can only assume we are drawing from the same knowledge base—even while I understand how unlikely that is. Why? Because the history I read and see cannot be the sum of every maker’s (or viewer’s) experience. Because I know that the history of everything will have holes that invite projection. Even still, I love history—big, long global histories with tons of details. I love the cultural histories embedded within, as well as the smaller sprigs of human endeavor that make great art along the way. Leaning on long world histories first allows the “process reader” to pass the art historical texts and head directly to larger cultural and technical bits we all can recognize from everyday living. This approach allows everyone to look directly to shared physical experience. What's more, it allows room for the inclusion of undocumented sources, things passed silently from an unknown teacher, a studio visitor, the great-grandparent you never knew. The revised histories I have read in the past few years give me hope as they fill in some holes that existed 30 years ago. Personally, I think about the spice routes that brought pepper to Italy for the first time. Which Pepe did that?8 Maybe not a Pepe at all. I’ll never know, not because it was too long ago, but because history will always have holes. In any case, the answer to the question lies in the direction of the route. Was she traveling west, or returning home from the east? Beginning-break-rapid is an English translation of the Japanese term “Jo-ha-kyū”. This is the most important aesthetic concept developed by philosopher, actor, and playwright Zeami Motokiyo (c. 1363–c. 1443). The term describes a structural aesthetic of forms in motion, originally conceived at the invention of Noh theater. However, in time it has come to describe and influence many other forms, like Gagaku music—both Shinto ritual and folk music, as well as the tea ceremony and martial arts. Some even use the notion as a structural guide for poetry and essay writing. My bear-like use of Jo-Ha-Kyu here in this text is all the evidence you need to see how ill-equipped I am to make scholarly use of this form. However, as an artist, I’m very agile at finding examples. I start with looking at two artists—each different but both use “beginning.break.rapid” as a joyful methodology of whole bodies moving, each cycle ending with keen eyes. We are all Americans. None of us are well versed in the concept. Everything is in translation. I am either leaning on deeply embedded family cultures or attributing the aesthetic to a wide array of “Western Abstraction” made during the last one hundred years. First generation New Yorker Kenji Fujita gathers, folds, and unfolds. He cuts and casts. Sometimes there is noise, other times I think he listens to music (let’s remember to ask). He plays tricks on himself many times over and over. He is alone, smiling, softly drilling, or dribbling liquids that are meant to turn hard. He pokes something, coloring occurs and he glares. Order is arrived by looking and walking and looking. The fix is in. Kenji moves into another round—to the wall, the work bench, then the wall again. In between a screw, a staple, a screw, some color. “Where did that other piece go?” Small smooth steps and lots of looking. On the way out of the studio he says, “Be careful, the sidewalk slants.” It does, so I do. He says it only for me. His legs already know. Nebraska-born painter Barbara Takenaga accumulates color by directing viscosity—a thin version. Everything is flat, paint dries quickly, she pets the surface. Layers of lakes stay in their directed location. Some veins collide, others resist while nudged into a cosmic pas de deux, then three, then more. No rest for the arm or the elbow, not to mention the wrist. Down, down, down, I see the contacts accumulate into long deep thoughts about something (the dog, dinner, mom). Next comes the splendid no-thinking of being alive in the making. An arc concludes; it’s too wet; there are no more turns left to spin this rectangle. Pause, patiently. All of a sudden the layers of pools and strokes quit their leakiness. The flatness is turned up for looking. Some sneaky painting occurs, or doesn’t. Images coalesce and we are shot into space. beginning.break.rapid: Kenji Fujita & Barbara Takenaga is supported, in part, by Deanna and Fred Bosselman, Douglas County, Omaha Steaks, and Security National Bank. Kenji Fujita is a visual artist who makes work out of ordinary materials such as cardboard, aluminum foil, felt, wood, fabric, paper, and paint. Whether flat or dimensional, he creates commonplace geometries of shape and form that are then cut, torn and glued into unexpected amalgams of order and disorder. In Fujita's three-dimensional works, relations of shape, form, and structure become animated as the viewer engages with the work in physical space and time. 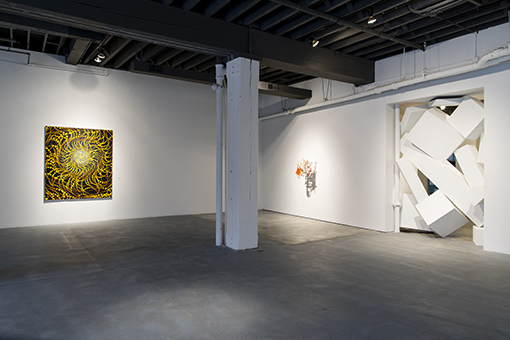 Select solo exhibitions of Fujita’s two and three-dimensional works have been mounted at venues that include Samson Projects, Boston, MA; Luhring Augustine Gallery, New York, NY; Jean Bernier, Athens; and Daniel Weinberg Gallery, Los Angeles, CA. Fujita’s work has been included in many important group exhibitions at, for example, the American Academy of Arts and Letters, New York, NY; Michael Benevento, Los Angeles, CA; The Company (Anat Ebgi), Los Angeles, CA; The High Line, New York, NY; Aldrich Contemporary Art Museum, Ridgefield, CT; and "Aperto 88” Venice Biennale. Fujita’s work can be found in the collections of Albright Knox Art Gallery, Buffalo, NY; Brooklyn Museum, NY; Los Angeles Museum of Contemporary Art, CA; and Weatherspoon Art Gallery, Greensboro, NC. He has received grants and fellowships from the Adolf and Esther Gottlieb Foundation, Pollock-Krasner Foundation, New York Foundation for the Arts, John Simon Guggenheim Memorial Foundation Fellowship and the National Endowment for the Arts. He was born in New York, NY and now lives and works in Staatsburg, NY. He has taught at Bard College, Annandale-on-Hudson, NY since 1995 and School of Visual Arts, New York (SVA) since 1993. Barbara Takenaga is a painter whose work is informed by the rich multi-stepped materiality of her printmaking roots, as well as the expansive space/time of her birthplace, North Platte, Nebraska. Her abstract paintings present a confluence of affinities from the ornamental to the extra-terrestrial; profoundly deep spaces are built with extremely flat surfaces. 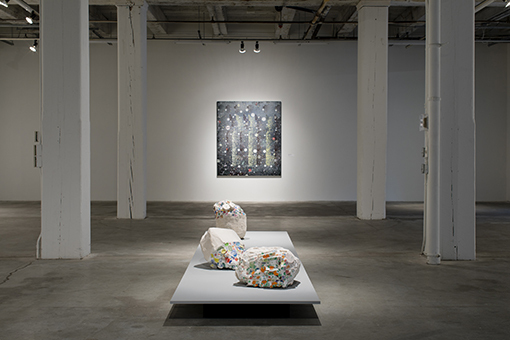 Barbara Takenaga’s most recent professional engagements include the first in-depth survey of the artist’s work mounted by the Williams College Museum of Art, Williamstown, MA. Guest curated by Debra Bricker Balken, the exhibition and accompanying catalogue present both a celebration and assessment of the work, revealing how Takenaga has enriched the languages of abstraction during the past two decades. Public programming with fellow New Yorker and painter Tom Burckhardt engaged the community with a discussion concerning painting, abstraction, and geometry. Catalogue texts by Balken, novelist Jim Shepard, and poet Geoffrey Young also shed light on a community of creative intellectuals among whom Takenaga has had a major role since 1985. In June of 201, Takenaga will step down from her role as the Mary A. & William Wirt Warren Professor of Art at Williams College. Of course, this means she will no longer divide her time between Williamstown, MA, and New York, NY, where she has maintained a studio throughout. 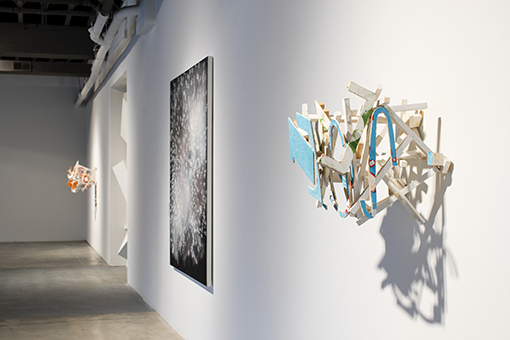 Her work has been widely exhibited at institutions including MASS MoCA, North Adams, MA; Museum of Contemporary Art, Denver, CO; National Academy Museum, New York, NY; SPACE 42 at the Neuberger Museum of Art, New York, NY; Asian Arts Initiative, Philadelphia, PA; and the Philadelphia Academy of the Fine Arts, Philadelphia, PA.
Takenaga’s work is in the permanent collections of The Ackland Art Museum, University of North Carolina, Chapel Hill, NC; Smith College Museum of Art, Northampton, MA; The deCordova Museum, Lincoln, MA; Museum of Nebraska Art, Kearney, NE; and Frederick R. Weisman Art Foundation, Los Angeles, CA, among others. Takenaga is represented by DC Moore in New York, NY and Gregory Lind Gallery in San Francisco, CA. She lives and works New York, NY. 1Caruso, Hwa Young Ed. D. Asian Aesthetic Influences on American Artists: Guggenheim Museum Exhibition. International Journal of Multicultural Education, Vol. 11, No. 1, 2009. 2The recent exhibition: Abstract Expressionism: Looking East from the Far West, curated by Theresa Papanikolas for the Honolulu Museum is especially timely. 3Wu, Danielle. “Asian-American artists engaged deeply and creatively with Abstract Expressionism, counter to historical views of the movement as a New York monolith,” Hyperallergic, January 9, 2018. 4St. Fleur, Nicholas. “In Cave in Israel, Scientists Find Jawbone Fossil From Oldest Modern Human Out of Africa,” The New York Times, January 25, 2018. 5Gene E. Robinson, Russell D. Fernald, David F. Clayton: Genes and Social Behavior. Also published in Science 07 Nov 2008: Vol. 322, Issue 5903, pp. 896-900 DOI: 10.1126/science1159277. 6Rettner, Rachael. Epigenetics: Definition & Examples. LIVE SCIENCE, June 24, 2013. 7Perhaps it’s because I’m a sculptor trained as a craftsperson, or perhaps it’s because I come from generations of modestly literate peasants. 8“Pepe” means “pepper” in Italian. 9Oida, Yoshi and Lorna Marshall. “The Notion Of Jo, Ha, Kyu.” The Invisible Actor. Metheun/Bloomsbury 1995.